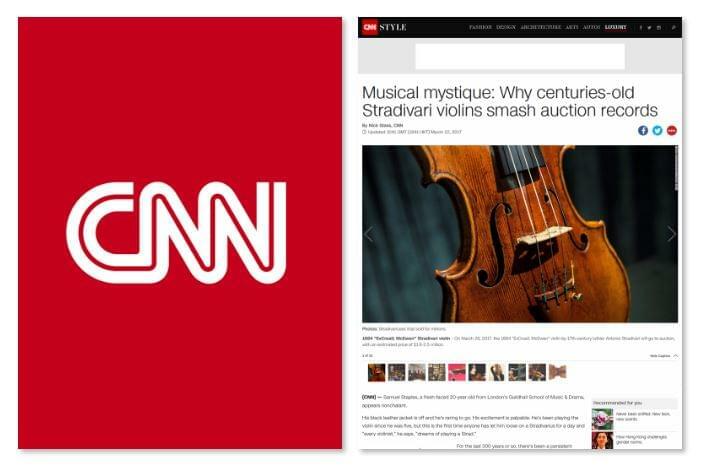 1684 “ExCroall; McEwen” Stradivari violin – On March 28, 2017, the 1684 “ExCroall; McEwen” violin by 17th-century luthier Antonio Stradivari will go to auction, with an estimated price of $1.6-2.5 million. Samuel Staples, a fresh-faced 20-year-old from London’s Guildhall School of Music & Drama, appears nonchalant. For the last 300 years or so, there’s been a persistent mystique about the great Italian luthier Antonio Stradivari and his violins. In a long life, he produced about 1,100 stringed instruments — violins, violas, guitars and cellos. About 550 violins (out of an estimated 960) are still with us today. These days, the finest Strads can sell privately for more than $15 million, usually to banks, charities and music patrons, and are loaned out to leading violinists. Staples warms the violin up with a few classics — a bit of Bach, a bit of Tchaikovsky, Sibelius and Mendelssohn. A pinch mark the size and color of a peach is visible under his chin, where the violin rest has wedged into his skin. He’s oblivious to it. On March 28, the instrument Staples is playing — the 1684 “Ex-Croall; McEwen” violin, named after former owners — will be up for auction at Sotheby’s in London. And with a sale estimate of $1.5-2.5 million, it’s a relative bargain. Ingles, a co-founder and of the specialist fine instrument dealers Ingles & Hayday, will be the auctioneer when the violin is put up for sale. This is an entirely new experience, cradling something so valuable. The violin is breathtakingly light — less than half a kilo, roughly the weight of a can of beans or a baseball — and, of course, it’s exquisitely crafted. Why, I ask, are they so prized? Many leading violinists like Joshua Bell and Nicola Benedetti play Strads, and usually an intense bond develops between player and instrument. The German violinist Frank Peter Zimmermann said his Strad “feels like part of my body” in a 2012 interview with The Strad magazine. For the last 34 years, Florian Leonhard has restored and sold Strads from a workshop in Hampstead in North London. He currently has four for sale, including one that he’s very excited about from Stradivari’s much coveted Golden period (1700-25). Oxford’s Ashmolean Museum has one of these, too: “The Messiah” from 1716, perhaps the most famous and immaculate of all Strads. He suggests that “The New Messiah” could be worth up to $20 million, which would be a new world record for a Strad violin. But the violin market can be hard to predict. In 2014, Ingles & Day offered a Strad viola, “The Macdonald,” for a whopping $45 million. The market evidently thought that this was ridiculous and there were no bids even close to the asking price. He’s been showing the “Ex-Croall;McEwen” to potential buyers since December. Having priced it modestly, Ingles is very much hoping to find it a good new home. Going to auction with it runs an inherent risk: if it doesn’t sell, it’ll be that much harder to sell it later. We shall see if that applies in this instance.